Nick Barley introduced the motion: Is it time a crime novel won the Booker? Before arguments began, he took a vote. 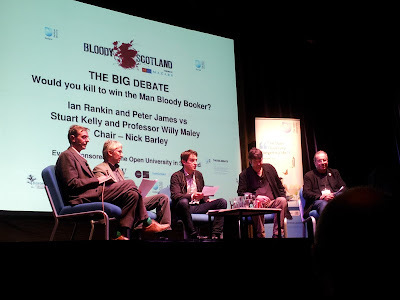 In an auditorium packed with 300 crime-writing enthusiasts, only 3 hands (my own included) voted against the motion. The critics were onto a hiding to nothing. Professor Willy Maley took the house by storm. Unfortunately he delivered his speech, in which there was punchline after punchline, so rapidly that I had no time to take copious notes. Besides which, I was laughing too much. 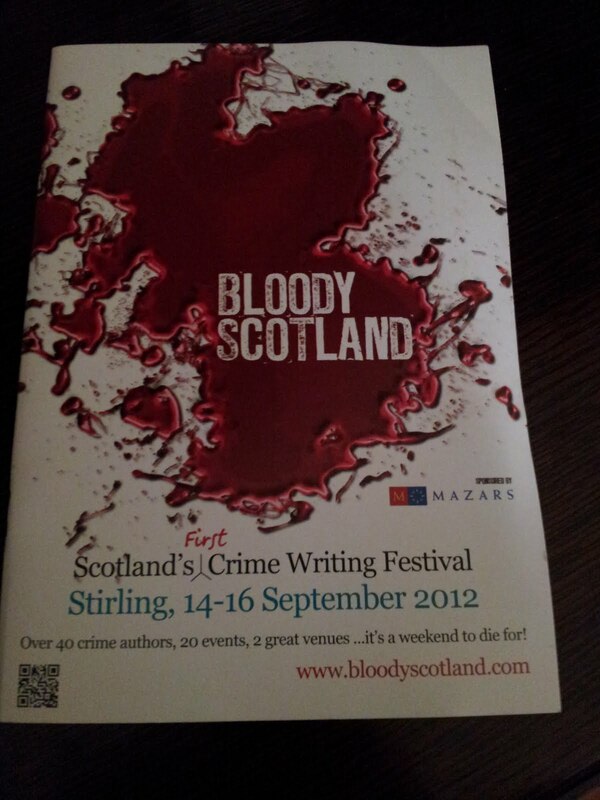 Crime writers are being greedy, he said. They already have readers, mega sales, and money from their own prizes. They can’t have the literary Booker as well. He quoted James Kelman’s blistering attack against the genrification of fiction. He also claimed the superiority of the free form and subject matter of literary fiction. A literary novel may contain a crime. A crime novel has no choice. Ian Rankin talked about crime novels transcending their genre. The problem, he said, is that as soon as a crime novel does this, it ceases to be a crime novel! Crime novels can be political novels, as in Scandinavia and France. They can also be literary, particularly if they have the word snow in the title: Snow falling on Cedars and Snowdrops being cases in point. There is mystery in all writing, he argued. It is, by its very nature, the art of withholding information. Stuart Kelly defended the right of any prize to define its own criteria. The convention of the genre is a blunt instrument on which to measure crime fiction. Crime and Punishment is as fine a literary crime novel as there ever was and he based his own opposition to the motion on the basis that crime novels have already won the Booker: Something to answer for, Rites of Passage, The Blind Assassin, The True History of the Kelly Gang, Vernon God Little, and Wolf Hall. Peter James: How ironic is it that the Booker Prize is funded by the literary estates of Agatha Christie, Ian Fleming and Dennis Wheatley? Greene’s Brighton Rock changed all the rules. Not only did the mind of the criminal suddenly become the plot but it was the first crime novel to attain the status of literary fiction. There are no rules in crime fiction now, he said. in fact, crime on the spine is purely a marketing tactic. Stuart Kelly listed other crime novels that can easily be labelled literary: Asta’s Book and King Solomon’s Carpet, both by Barbara Vine; John Le Carre’s The Constant Gardener and Allan Massie’s novels set in Vichy France. He added that he would be delighted if Sophie Hannah won the Booker one day. Her novels are exceptional, he said. As you can see this was a very civilised bout in which the opposing sides sometimes forgot which side they were on. Peter James, the most rigorous defender of the right of a crime novel to win the ultimate accolade, made the most outrageous statement of all. Despite all my arguments, he said let’s be quite clear. I’d rather have my gallbladder removed without anaesthetic than win the Booker Prize! Let’s be quite clear, I thought, I’d perform that operation on you as payback for your snide opening comments about Keri Hulme’s wonderful novel. And so, when Nick Barley asked if any of the original 3 opposers of the motion wished to defend their position, my hand rose of its own accord and I crossed swords with Mr James, defended The Bone People, and uttered something about no matter how good a crime novel is, I have never awarded 5-stars to one. Driving home I realised I was talking nonsense. I have and it was to China Mieville’s The City and The City. (Mr James, I herewith return your gallbladder.) Even so, I would not have been happy for it to win the Booker in 2009, not in the year of Wolf Hall. Anyway back to the debate. The chairman asked for a second show of hands and there were now somewhere in the region of 20 hands raised opposing the motion. Meaning minds had shifted from the idea of a crime novel winning the Booker and the defenders of the literary faith had won the day!